You know the story: there’s always a pot of gold at the end of a rainbow, usually accompanied by a little Leprechaun and other fairyland creatures. But how do you actually find the end of a rainbow? 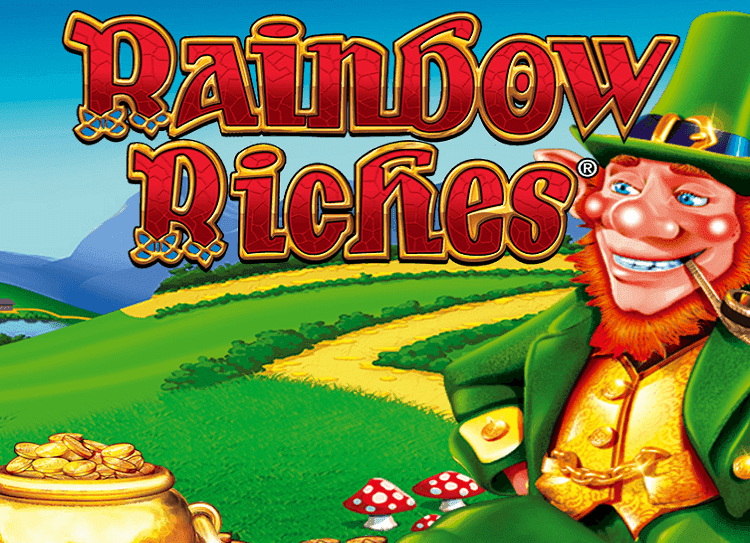 This Irish-themed Rainbow Riches slot game aims to take you there, to find the Leprechaun and take his pot of gold. Bit harsh, but how many people have actually even made it to the end of the rainbow? We have paid our dues on megareel. This tasty little number comes from the brains of Barcrest Software, an oldie but goodie. Barcrest has been in the game since 1968, and at one point you could find their games in all the British pubs and casinos in its heyday. The brand have managed to continue with a strength not all companies have: they were bought by IGT back in 1998, then on to Scientific Games in 2011. They’re an innovative company, always aiming to be at the forefront of trends: hence their longevity and recent online slots. This game is exactly what it says on the tin: a standard Irish-themed slot, with a medium volatility and a cheeky gameplay. The five reels are set upon a purple background with gold either side of the screen, and that mischievous little Leprechaun watching your every move. The symbols on the reels aren’t too exciting in the way of variety: you’ve got the regular playing card symbols from 9 to Ace, then the games logo, a bonus symbol and a wild. Out of the regular symbols, the logo is the highest value – paying out a x500 multiplier if you land 5 of them in a spin. The wild symbol substitutes for all other symbols on the reels except the bonus symbol, and can help contribute to winning paylines. The bonus symbol also acts like a wild in that it substitutes for all other symbols on the reels, but also acts like a scatter in the fact that it helps to trigger the free spins round. Scatter symbol is the ‘free spins’ symbol and if you land these in a spin, you’ll trigger the free spins round. The amount of free spins you get depends on the amount of bonus symbols you triggered the round with. The free spins bonus symbols only appear on reels 1, 3 and 5. The symbols actually stack on the first reel, which is how you’ll land the free spins round – as only symbols on this first reel will trigger the free spins. Free spins round - You’ll either be awarded with 10, 15 or 20 free spins, dependant on how many symbols you triggered the round with. If you land one bonus symbol on the first reel you’ll be awarded with 10 free spins, if you land two symbols you’ll be awarded with 15 free spins, and if you get three stacked symbols on the first reel you’ll get the max 20 free spins. 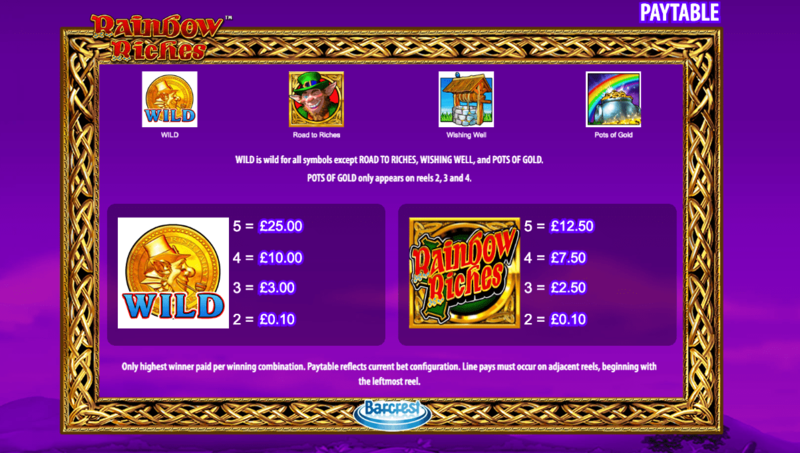 Although the Irish themed slot games are everywhere, this Rainbow Riches slot game still offers a decent slot game: as do most. With free spins, multipliers, scatters and double wild symbols, this slot game can offer up wins at a pretty regular rate due to its medium volatility, meaning that you don’t have to be a patient player to rack up the wins. If you're looking for your next game and enjoyed Rainbow Riches, try Raging Rhino.